Love – Anecdotes from a Mom, Wife, Sister & Daughter. Sometimes when you snore, I rest my hand on your arm, in the valley between your elbow and bicep. One more deep breath, exhale, and you are still. The warmth of my palm persuades you to rest easy. My hand slips away, to hide under my cheek. Minutes pass, and I lay uneasily in the dark. Restless mind after a long day. The silence rings in my ears. I rest my hand once more. A mild gasp startles in your throat, and you turn on your side towards me. Your hand, outstretched, discovers my shoulder and caresses my arm, ultimately cradling my elbow, persuading me to sleep. I cuddle back under the sheets on your side of the bed after you leave with the kids to school. It’s always a lil warmer than my side, and it’s better for my shoulder I say. Bunch the t-shirt you wore last night around my neck. The soft aroma of your cologne and Dove soap fill my nose, and I’m instantly drowsy. One long breath and sigh, and I’m drifting away. I pull our comforter, like your arms, tighter around my shoulders. I nestle my head into your pillow that gently cradles my neck and deters my worries. I don’t miss you, because you’re not gone; but I need you. It’s not about time or distance, just a matter of existence. I pulled up to the house, the usually clank, clank as I rolled through the gate. Turned the radio down. Grabbed the wrapper from my breakfast biscuits, half full can of day old La Croix, and gas station receipts, some hard dried up play doh, and stuffed it in a plastic Walgreens bag. Car Key. Glasses. Purse. Garbage. My husband opened the door as I stood there fumbling through my Mary Poppinesque bag for the keys. I adjusted the strap of my blue messenger, switched the bag of garbage I had collected from my car to the other hand. He smiled longingly at me as I caressed his neck with my free hand. Keys and sunglasses collided with the school pictures of the kids as I tossed them on the table by the door. Walked around the red scooter the kids left in the hallway. A shoe box on the kitchen counter caught my eye, but I casually placed my bag down next to it and walked over to the sink to pour out the remaining La Croix before I tossed it. ”Is that for me?” I asked, tilting my head back, not sure if he was in the room yet, but looking for him in the reflection of the kitchen window. I grabbed the box as he walked up to me. They were white cycling shoes. Seven and a half. I had gotten him a Peloton for Valentine’s Day, and had been thinking about trying it, but hadn’t gotten myself a pair of clip-ins yet. ”Happy Birthday,” he said warmly. ”I love them! Thank you” I kissed him and wrapped my arms around his waist, and rested my head on his chest. ”What do you get the girl that can buy herself anything,” he stated. ”Well, not anything,” I said rolling my eyes, smiling. And we held each other. Usually, we get this from our parents with whom we’ve had some disagreement or misunderstanding, or yes, even a full-fledged screaming match (e.g. with Mom…again). But how often do we think about when we are old and gray like our parents? Parents of newborns deal with late night feedings, messy diaper changes, inconvenient spills, a barrage of items to tote around (don’t forget to get the baby), and having to adhere to an infant’s schedule. Babies are so tiny and helpless, AND WE ADORE THEM! You could be exhausted, drained, tired, on the brink of an anxiety attack; and yet you* will still get up each and every time the baby monitor starts lighting up like Times Square on New Year’s. They can’t thank you or call out, except for the crying, and yet you don’t resent them. *”You” in this case refers to good mothers and/or fathers, where such is the case. Depressingly enough, we all know some lame moms and dads. But as the children get older, parents often talk about how hard it is, how unappreciated they are. The kids begin talking (complaining) and doing (asking you to do) more and more things for themselves, and you begin to notice all the little AND big things you do for them that go unnoticed, and without a thank you. I mean sometimes, you get a loose hug or a forced, “Thanks mom”, but more often than not, your children will take you for granted, and yet you continue to cater to their every need, demanded and unspoken alike. *Some of you who know me and my family, are thinking, just wait ’til your 9-year-old daughter is a 13-year-old nightmare. I know, I know. I have a loooooooong way to go before I’m licensed to preach, but I have learned a thing or two from my own parents along the way and from the relationships I’ve been able to observe around me. And, unfortunately, myself to be included, we are mostly failing, not at parenting our children, but at taking care of our “Adult Kids”. What the heck is an “Adult Kid”? And please don’t misinterpret this as a derogatory term. As far as your parents are concerned, you will always be their “baby“, but, unfortunately, at one point in their lives the roles begin to reverse and they become an “Adult Kid”. Several years ago, this short anecdote was brought to my attention by my father. I don’t have the original he showed me then, but there are several versions you can find around the internet. This one is from Snopes. A frail old man went to live with his son, daughter-in-law, and four-year old grandson. The old man’s hands trembled, his eyesight was blurred, and his step faltered. The family ate together at the table. But the elderly grandfather’s shaky hands and failing sight made eating difficult. Peas rolled off his spoon onto the floor. When he grasped the glass, milk spilled on the tablecloth. The son and daughter-in-law became irritated with the mess. “We must do something about Grandfather,” said the son. I’ve had enough of his spilled milk, noisy eating, and food on the floor. There, Grandfather ate alone while the rest of the family enjoyed dinner. Since Grandfather had broken a dish or two, his food was now served in a wooden bowl. When the family glanced in Grandfather’s direction, sometimes he had a tear in his eye as he sat alone. That evening the husband took Grandfather’s hand and gently led him back to the family table. For the remainder of his days he ate every meal with the family. And for some reason, neither husband nor wife seemed to care any longer when a fork was dropped, milk spilled, or the tablecloth got soiled. Children are remarkably perceptive. Their eyes ever observe, their ears ever listen, and their minds ever process the messages they absorb. If they see us patiently provide a happy home atmosphere for family members, they will imitate that attitude for the rest of their lives. Somehow, as we get older, our responsibility as a parent and adult becomes more important than our responsibility as sons and daughters, or even as brothers and sisters. “We” are no longer our parent’s problem, and we’ve got our own problems to deal with. Our parents take a backseat to our own parenting. Suddenly they find themselves with no one to look after them. Suddenly, there isn’t a family unit that can depend on each other; instead, everyone has been broken off into independent sectors. To each his own. The truth is your parents, grandparents, or even siblings may eventually become as time consuming and/or costly as your own children. They need to be taken care of; perhaps even fed, bathed, or changed; taken to the doctor or market. They need to be nurtured, talked to, and listened to just like your kids do. They need love and attention, even when it is burdensome. No one will admit that their children can feel like a burden, because they think that will make them sound like a bad parent; however, how quick we are to express how much of a heavy load our elders have become. Your parents would never choose to put a strain on your life, in the same way a baby doesn’t choose to come into this world. We demand so much of our parents and elders, whom rarely demanded such from us. No one is saying it is easy to care for either an infant or an elderly person; nor am I suggesting one can’t voice their discontent or frustrations. We are only human. However, we must not forget our Duty. Yes, we LOVE our family, and we should do all things out of love. Love is about sacrifice, and sacrifice usually means doing something you don’t really feel like doing. I read a quote on Facebook today about marriage being 100/100, rather than 50/50. You have to be willing to give everything; and this applies to any relationship with a loved one, not just marriage. We have to love and support each other even when it is hard and inconvenient; even when we do not think our actions will be reciprocated. Life can be difficult enough when you are young, healthy, and independent; imagine how it must feel for your elders, or those who are sick and dependent on others for care. That short story really touched my heart years ago; it still gets to me every time I read it. Yet I can’t say that I have done much to change. As of late, however, it keeps coming to the forefront of my mind. And although the main focus of this post has been that we should care for our elderly loved ones, it is really a call in general to not abandon your family. No matter the distance (please do not break out into the Backstreet Boys), no matter what may occur between you and your loved ones; forgive and forget, move on and love on. REMEMBER: Kids are like sponges, observing and ABSORBING everything around them. Let them observe and Absorb your good ways. I challenge all (10 of you reading this) to take just 5 minutes out of each day for your parents, grandparents, or any loved ones that might need your love and attention. 5 minutes is a mere .3% of your day. YES, POINT 3 Percent. Not even 1 %! Do the math. You spend a lot more time in the bathroom doing your necessities, so to speak; let alone on useless nonsense like social media and the internet. Do not rebuke an older man harshly, but exhort him as if he were your father. Treat younger men as brothers, 2 older women as mothers, and younger women as sisters, with absolute purity. When my biggest concern was missing the clown at the end of the year party in kindergarten, because I had caught the chicken pox from my sister. Mrs. Rodriguez had been talking about the party for weeks. It was a big deal! ::rolls eyes and grumbles:: I can’t believe I missed it. Can you imagine the impact those last two weeks of school would have had on my life? I had my first crush in 3rd grade. He was funny and cute… Dumb. As. Rocks, though. He brought his dad’s credit card to school one day. He was so cool! It said his name right there on the card. He held it up to me gleaming. The plastic coating that made the card shiny, rather than just a dull matte blue, was slightly peeling off one corner. It was just a little bit, but naturally, I pulled on it and a huge piece flaked off. It’s like a scab, and who can resist picking a scab?!? My eyes opened wide, as did his. His face turned a bright red, and his eyes welled up. He ignored me for weeks! Okay, so it was just a few days, but it seemed like forever. Our desks were arranged in groups of six, and ours faced each other. We didn’t have twitter or hashtags back then, but seriously #FirstWorldProblems. I hesitated on the sidewalk that day—to the left was the field with the big tree, to the right, the pick up line. I pulled nervously on the black straps of my backpack and waited at the pickup line. It was the last week of school; my last week at that school. He didn’t say anything about it the next day. I imagined that he had waited by the tree, and watched me drive off in my uncle’s red Buick Regal. Stephen King. LOL! I bet you thought this post was taking a dark and twisted turn. But no, I simply fell in love with his writing and with reading in general. I started writing poems here and there. At school we learned about Haikus. HaiWho? HaiWhat? I wrote more and more. My best friend and I would write short stories, mostly murder mysteries. We haven’t published any just yet, but any day now we’re gonna dig through those boxes of journals and notes and yearbooks, and I bet we have some real gems in there! I also loved Archie’s Digest. My mom would always pick one up for me in the checkout line at Publix. I always thought my best friend and I were Betty and Veronica. Her name was Veronica, but I wasn’t blonde. Well, neither of us were. Ah the point is they were best friends, and I identified us with them. Das it! This is beginning to read more like one of my journals, and boy did I have tons of them! Thirteen, and I’ve decided I’m gonna be a lawyer. It’s more like I was pushed into it by my father. I prepared many opening statements, and filed countless motions before him. Unfortunately, I never won any cases. He was the opposing counsel AND the judge, kinda one sided there don’t you think? So, what do a budding teenager and her old fashioned father argue about you might ask. For starters, anything that involves being out of the house with other people, aside from school or work, regardless of the time of day. It was harsher than it sounds. Whether it was just hanging out at my best friend’s house, going to a movie, or roller skating at Hot Wheels, the answer was an affirmative “No!”, and only sometimes a tortured “Yes”, thanks to my mom’s nagging. Oh, and God forbid I mention the beach, or come home from the “mall” with a tan. I just wanted to hang out with my best friend, listen to Aerosmith, and talk nonsense (but very important, best friend nonsense) over a slice of Papa John’s and some Chips Ahoy cookies. Imagine if we had done everything we had planned back then? You turn 15 and your dad turns into an even bigger drag! My inseparable best-friend and I are now separated by way of about 26 blocks between our high schools. Not very far on a map, or driving time, but apart nonetheless….creating a gap that opened ever so slightly each day, like bolts you turn to stretch a bone. A little pain each day, until suddenly you are taller, or in this case more distant. I met a boy. Well, if you ask my father, he was a man. He did have a lot of facial hair, and chest hair, and arm hair, and leg hair. OKAY, he was all hair, and hair meant he was not a boy. Beware the hair, mommas and poppas! OF COURSE, I thought he was “the one”. That wasn’t really why I thought he was the one. I was young, but I was in love. And contrary to all of my fathers…”instructions” let’s call them, I was certain that he was right for me. I was only 15, but I was right. I hit the big 2-1! I could now drink “legally”! Woohoo! My high school sweetheart proposed on my 21st birthday, April Fool’s Day. Thankfully, it was not a prank! But I wasn’t shocked. I did not break down in tears. Somewhere, there is footage on an old video camera that captured the moment. WHERE IS IT? I don’t know, but the important thing is: I. did. not. cry. Am I heartless or cold-hearted? Some might say yes. But I wasn’t. I didn’t cry because I wasn’t shocked. I loved him, and I knew he loved me. I wanted to get married eventually, but we had what mattered the most already- love and each other. So I said yes, slipped the ring on my finger, and we went upon our merry way. HAHA! Just kidding. We’ve got 4 amazing kids, and I couldn’t be happier. I do cry a lot more these days, though. Once you have kids your hormones and emotions just spiral out of control. Okay, that could just be me… Moms? My best friend is still that. Life can be exciting, but unpredictable. My life is not perfect. It’s great; not perfect. But I am happy, nevertheless. Do I ever question life, the whos, whys and whens? Yes, I’m only human, of course I do. But I never regret, and I never wish to go back or relive. And that DOES NOT mean act like an idiot; live today, who can speak for tomorrow. For me It means live for today, because yesterday is gone; what have I learned from my choices and experiences, and what can I do with them now for a better tomorrow. And while there are things that I wish had not happened in my life, or perhaps, that had just happened differently, I am certainly glad I never went to the big tree that day. Today, I saw the first tears of the year. Not mine, although I shed them pretty easily these days. Pregnant = a tad Emotional. I have only seen my father shed tears a few times. One of the more memorable times was my wedding day. It was almost time to walk down the aisle. Everyone left the dressing room to line up. It was just me and dad. We paced around the room quietly and finally sat down on a bench in the middle of the room. Our backs were turned to each other slightly. I looked over at him to say something, anything to break the awkward silence, and then I saw it. A tear on the corner of his eye. I looked away. But it was too late. My eyes were welling up with tears. I looked up at the ceiling and tried to think about something else so the tears would dry up. I had been just fine until then, when I realized how big this really was for him, and not just me. Somebody came to get us at that moment. We choked the tears away as we walked down the aisle. He kissed me and handed me off to my future husband. There have been other moments of joy of course. Too often, however, my father’s tears have been brought on by the passing of a close loved one. My uncle, Julian Rigoberto Valdes Sanchez, passed away almost 8 years ago after a short battle with cancer. He had been sick for months before doctor’s could arrive at the right diagnosis. But, it was too late. I believe he had just one chemotherapy treatment, and then he was gone. We visited him at the cemetery today. He would’ve been 83 years old. My uncle was a natural teacher and leader, although many might have only seen him as a servant. He was a simple, God-fearing soul. He didn’t care about the luxuries of this world—things he knew he couldn’t take with him. He cared about people, his friends, his family. Tio Rigo did not know how to sit still. Whenever he came to stay with us for a couple of days, he could never just kick back and relax. He was always in the yard, uprooting weeds, replacing old plants with new fresh ones, arguing with the gardener about the right way to trim the rose bushes. If something needed repairing he just got out the ladder and got to work. We didn’t ask him to do it, it was just his nature. He was noble and kind, and very wise, but in a quiet unpretentious way. I remember one day when I was about seven. He was trimming the palm trees in my parents backyard. I wasn’t much help, but ever curious, I hung around the yard, and watched him work endlessly. He came down from the ladder after cutting a palm branch. He had a nest in his hands. Cute, except it was a rat’s nest. There were 5-6 little babies just squirming around blindly. I knew he was going to kill them; my father was terrified of rats. Thinking back, I don’t think he was as shocked as he should’ve been by my reaction. He told me he would just release them somewhere else. There was always a goodness and a sincerity in his eyes. I don’t know what he really did with the nest, but he loved and respected me enough to let me believe he would spare them. He was a hero that day. Another time, many, many years later, one of my pet turtles died. Mr. Turtle, who was actually a Mrs., was 5 years old. My husband had given her to me when we started dating. She was obviously very special to me. I buried her in the backyard, even made a little makeshift cross with some twigs to mark her little mound. It was really very silly. But, a couple of days later, I walked outside and found my uncle kneeling down in front of Mrs. Turtle’s tiny grave. He was praying. I couldn’t believe it. It was something anyone else would’ve just walked past and ignored, but he took the time to acknowledge it. He lowered himself on his knees to pay respect to my pet. That was my uncle. He never presumed himself to be above anyone or anything. He was a humble servant, son, brother, father, grandfather… my uncle. “Not many people can say they had a brother like Rigo,” my father said looking away from my uncle’s grave. We slowly walked away. My father has lost other siblings, and he has suffered dearly with each passing, but Tio Rigo, I think, was something more. A father figure perhaps, rather than just a brother. And I can’t imagine losing my father. This weekend we attended a destination wedding in Colombia. We overcrowded a large chiva bus that drove us around town blasting music. There was dancing in the aisles, and much cheering each other on as we, unsanitarily, gulped whiskey from a bottle we passed around; several bottles, actually. 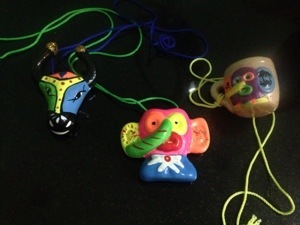 We wore printed straw party hats and colorful thematic necklaces with traditional Colombian designs—elephant masks & bull heads. I watched a friend’s husband as he gazed at her from across the torn leather seats of the chiva bus. At some point during the excitement of cheering, dancing and exchanging saliva and liquor, they had been separated. He searched for her through the people dancing and drinking in the aisle. She didn’t notice him staring so earnestly at her. He smiled. Maybe it was partly his loins that yearned for her. After all, the next night he would jokingly hump our table at the reception after a little borrachera from one too many drinks and cigars. But right now, it was his eyes that smiled, admiring her beauty as she laughed and clapped at those around her. We held tight to the champagne bottle bubble favors the coordinator had handed us at the door of the church. We waited excitedly for the moment we could start blowing bubbles. Not so much because it meant our two friends were now united forever by GOD, but because blowing bubbles is fun, Damn it! A few of my friends, okay just one of them, innocently blew bubbles into the aisle before it was “time”. What a rebel! We laughed. The clear christmas lights adorning the white rose and hydrangea arrangements along the aisle, shone hopefully through the tiny spheres that drifted above our heads. I think we all wanted to shout the word as he stumbled through it. Fidelity is probably not the part of your vows you want to falter on, but it was innocent nerves. Later, I watched my newly wed friends on the dance floor. The bride smiled affectionately as she sang to her husband. All eyes were on them as they belted romantic lyrics to each other, spinning each other around, sometimes fast, sometimes slow; at arms length, then real close. They saw only each other. They danced throughout the night; and always, love danced in their eyes. Another friend, overjoyed for the happy couple, chose Patron for her celebratory toast(s). Her other half watched as she poured another glass on the rocks, then swayed her way to the dance floor where she and other friends danced energetically. He reveled in how she enjoyed herself—dancing, laughing and taking pictures. Did she have a bit too much tequila? Maybe. But he never said a word; he never flinched; he never grimaced as she teeter tottered across the dance floor to use the bathroom. But, he was there to help walk her to their room, to take care of her in sickness, in hangover, and in health. Me and my better half sat together most of the night. I’m not big on dancing in general; the fact that 95% of the music was salsa, merengue or other Latin beat, didn’t help. A chicken with its head cut off has more rhythm than I do. We chatted and gossiped. We laughed and flirted. Looked at each other, looked away. We held hands, we held each other. We kissed. We didn’t stare off into the sunset. The view was mainly building sites that had just broken ground; other edifices, only 3 to 4 stories into the process; and some, just sites sectioned off for future use. Love, like construction, changes and grows; just never stop building.